7. Conversations with Egyptian Uber Drivers: Why Emigrate? Why Canada? We write in September 2017, in the wake of white supremacist rallies across North America, from Charlottesville to Quebec City. On each occasion, anti-fascist and anti-racist activists, along with other community members, confronted these rallies with large and diverse counter-demonstrations, largely shutting them down, overwhelming them, or rendering them caricatures of their original plans. On 19 August, Vancouver was the site of one such confrontation. A planned anti-Islam rally at Vancouver’s City Hall mostly failed to materialize alongside a counter-protest of approximately 4000 people, organized by an ad hoc group, Stand Up To Racism Metro Vancouver. As historians of migration and settler colonialism, we are reminded that these events – often represented as exceptional, new, or surprising – highlight much wider and older tensions in Canada. In particular, as we consider the recent events and their political stakes in Vancouver, we are struck by their resonance with something that happened in the city exactly 110 years ago today. Building damaged during Vancouver riot of 1907 – 130 Powell Street. UBC Archives, JCPC_ 36_017. 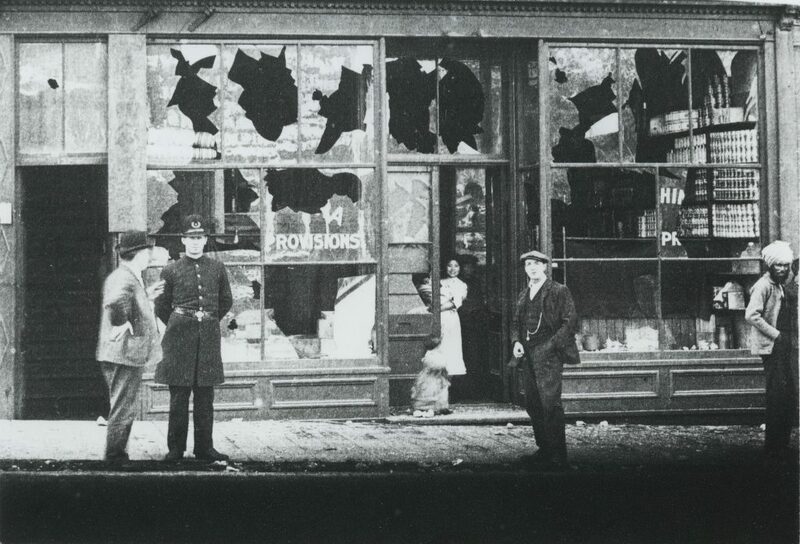 On Saturday 7 September 1907, Vancouver was gripped by one of the largest race riots in Canadian history. This event started with a large gathering of people who also marched on City Hall, in that case behind a banner that said: “Stand for a White Canada.”1 After listening to fiery speeches against Asian immigration, a significant number then headed to Chinese and Japanese neighbourhoods in the city, where they wreaked extensive property damage, physical violence, and terror. In thinking about the recent Stand Up To Racism event alongside the 1907 parade and riot, we could tell a story about how much has changed in a city now willing to turn out in numbers to drown out calls for a “White Canada.” But we could equally tell a story about how little has changed in a settler colonial city still organized around inequality and rage, including ongoing anti-Asian racism. Both of these arguments would be important and well supported with evidence, but here we want to reflect on a different issue. What questions does the 1907 event raise for us, and how do these relate to the questions we might ask–or more pointedly, often fail to ask–of the present? The 1907 Labour Day parade was organized by the Asiatic Exclusion League (AEL). Established in San Francisco in 1905, the League quickly established branches across the Pacific coast of North America. In Vancouver, the AEL was far from fringe, boasting members from a wide swath of society, including the mayor Alexander Bethune. Calling for the exclusion of Asian people from North America, the AEL was especially concerned about economic competition for white workers (blaming Asian workers for the low wages they were paid) and fearful of the social and cultural impact of migration from China, Japan and India. At the heart of the AEL’s arguments was the shared conviction that Canada should be a “white” country – a position that ignored Indigenous people and their sovereignty, and the existing diversity of non-Indigenous people, including Asian people who had been in and integral to what is now British Columbia for as long as white people had been. Despite the AEL’s arguments and some government efforts to restrict Asian migration (including a 1903 increase to the head tax on Chinese migrants), Chinese, Japanese, and South Asian people continued to move to Canada in the early twentieth century. It was in this context that the Vancouver AEL organized the 1907 parade. On the day, five thousand people marched from the Cambie Street Grounds to City Hall on Westminster Avenue (now Main Street), weaving its way through the largely Japanese and Chinese neighbourhoods on the way. Another two thousand joined at City Hall where the crowd listened to speakers demanding a ban on Asian migration. The mood was defiant. They sang “Rule Britannia” and the “Maple Leaf Forever,” then burned an effigy of Lieutenant Governor James Dunsmuir, who had recently prevented efforts by the BC legislature to pass further anti-Asian legislation. In the days that followed, Canadian politicians and the media decried what has been labelled a riot. On 10 September, the Daily Colonist’s top headline proclaimed: “Vancouver hoodlums disgrace their city.” Later in the issue, the editors clarified their position: they too were in favour of Asian exclusion, but property damage and violence in the streets were the wrong approach.8 Politicians, labour leaders, and other journalists made similar cases. For them, the riot was an unrespectable and ineffective way to show support for Asian exclusion, when compared to their primary tactics of parades, speeches, and policies. In other words, they were not concerned with the arguments, ideas, or emotions that drove the riot, but rather with the optics of mass violence. This position became even clearer in the aftermath. Primarily concerned about the diplomatic implications of the riot, Prime Minister Laurier dispatched a young Mackenzie King to assess and address the damages.9 In King’s view, the roots of the riot–and the general unrest on the coast–lay with Asian migration. In this, he echoed many white Canadians who also blamed the violence on the migrants rather than the rioters. King’s recommendations led to the 1907 Gentleman’s Agreement between Canada and Japan, which limited migration to 400 men per year. This was not the total exclusion that the AEL demanded, but was still a significant restriction that specifically targeted Japanese people. Overall, the riot and the federal government’s response, exemplified by Mackenzie King’s extended period in office, reveal the extent to which white supremacy was not only tolerated, but actually embedded in the mindsets of politicians and many other Canadians. While the government and media decried the violence, the longer-term result was an entrenching of the state’s commitment to white supremacy and the escalated exclusion of Asian people through new immigration controls. While many discussions of recent white supremacist events have focused on their historical parallels to Nazi Germany or the United States, the 1907 parade and riot serve as one reminder of the long local and national history of white supremacy in Canada too. Anti-immigrant racism and violence have been integral to white supremacist visions of a “white Canada” for well over a century, whether taking the form of government policies, mass gatherings at city halls, or violence in the streets. At the same time, the events of 1907 remind us of the importance of community action, memory, and education work. For too long, instead of thinking about the riot as central to Canada’s character, and the product of racial attitudes that imbued its governance at all levels, the events of 1907 were treated as an isolated incident, if thought about at all. But memories of the riot have endured powerfully within the Japanese, Chinese and South Asian communities in Vancouver. In 2007, a coalition of educators and community members staged an “Anniversaries of Change” event to mark the centennial of the 1907 riot, as well as the 1947 end of the Chinese Exclusion Act, the 1967 introduction of the universal immigration points system, and the 1997 handover of Hong Kong. The project involved curriculum development as well as a walk through the downtown core, which traced the 1907 events and acknowledged these other developments that have had a powerful impact on Asian communities in Canada. In a moment when commemoration is being hotly contested in the United States and Canada, from statues of Robert E. Lee to schools bearing the name of John A. Macdonald, it bears thinking about who does the work of remembering and commemorating histories that mainstream society would rather forget. And finally, the 1907 parade and riot invite other questions that resonate today too. For instance, who is seen as violent and why? What gets called violence? What is seen as restoring order, and which order is that? There are no single answers to such questions. But by asking them, the events of the past offer an invitation to re-think critical issues that remain too-often unasked of the present. 1. John Price, “‘Orienting’ the Empire: Mackenzie King and the Aftermath of the 1907 Race Riots,” BC Studies 156/157 (2007), 59. 2. Lillian Ho Wong in Paul Yee, Saltwater City: An Illustrated History of the Chinese in Vancouver (Vancouver: Douglas & McIntyre, 2006), 28. 3. The Bank of Canada’s Inflation Calculator only calculates historical inflation between 1914 and 2017. However, to provide a rough translation of these damages to today’s Canadian dollar, we used the 1914 rates; with those, the costs of the riot would be equivalent to approximately $34 336.75 and $173 330.77 today. 4. Daily Colonist, 10 September 1907. 5. Daily Province, 9 September 1907. 6. Daily Colonist, 10 September 1907. 7. For more on the parade and riot, see Price, “‘Orienting’ the Empire”; Erika Lee, “Hemispheric Orientalism and the 1907 Pacific Coast Race Riots,” Amerasia Journal 33, 2 (2007): 19-48; and Julie Gilmour, “Interpreting Social Disorder: The Case of the 1907 Vancouver Riots,” International journal 67, 2 (2012): 483-495. 8. Daily Colonist, 10 September 1907. 9. For details on the events in Vancouver in 1907 and their impact on Mackenzie King’s career, see Julie Gilmour Trouble on Main Street: Mackenzie King, Reason, Race, and the 1907 Vancouver Riots (Toronto: Penguin Books, 2014). 10. Mackenzie King, House of Commons Debates, 1 May 1947. Confronting Canadian Migration History by Laura Ishiguro and Laura Madokoro is licensed under a Creative Commons Attribution-ShareAlike 4.0 International License, except where otherwise noted.